With a wingspan of over 5 feet, the Osprey is one of the largest birds of prey in North America. It eats live fish almost exclusively and is therefore usually found near large bodies of water. The Osprey was a rare breeding bird in Tennessee before the large reservoirs were built in the early-mid 1900s, but like the Bald Eagle, it suffered low nesting success as a result of contamination from the insecticide DDT. Starting in 1979, an aggressive hacking program was begun by TVA and TWRA in the state. Hacking is a method of releasing young birds into suitable but unoccupied habitat. Between 1980 and 1988, 165 Osprey were hacked from 16 sites across Tennessee. While there is little specific information on the success of the hacking program, the number of active nests in the state increased from about 3 to 131, from 1980 to 1999 (the last year nests were counted). Over 150 nests were counted during waterbird surveys across Tennessee in 2012, however only maybe 10 percent of the river miles in the state were surveyed. This expansion was also facilitated by the erection of numerous nesting platforms across the state, which continues to the present. The Osprey is one of the most widespread birds in the world, found on all continents except Antarctica. During the winter, North American breeding Osprey mainly winter south of the United States, in Central and most of South America. Description: The Osprey is dark brown above, white below, with a white head that has a prominent dark stripe through the eye. In flight, the long narrow wings are bent at the wrist, and patterned brown and white. Males, females, and juveniles look similar. Voice: The Osprey is quite vocal, and gives short, shrill whistles, or a single loud, slightly slurred whistle.. Adult Bald Eagles have a completely white head and tail. Immature Bald Eagles are mottled brown and white, with varying amounts of white under the wings and on the head. Habitat: Large rivers, lakes, and reservoirs. Diet: Live fish, typically 5 to 16 inches in size. Ospreys hover over the water and then plunge feet first onto their prey. Nesting and reproduction: Ospreys do not start nesting until they are at least 3 years old, and will usually return to the nest used in the previous season. Clutch Size: 3 eggs, occasionally 2 or 4. Incubation: Both members of the pair incubate the eggs for 32 to 43 days. Fledging: After the young hatch, the female stays with them, and the male brings food. Once the young can be left alone, both parents provide food. The young do not fledge until they are 44 to 59 days old. Nest: Ospreys build large nests near water, on top of dead trees or artificial structures such as nesting poles, utility poles, and cell or TV towers. Nests are made of branches, sticks, and twigs, and lined with smaller twigs, grasses, and other material. The nest is used for several years with new material added each year. Old nests can reach 7 feet across and 5 feet deep. Nest Platform instructions here. Status in Tennessee: The Osprey was a rare breeder in Tennessee before the construction of large reservoirs. It was listed as Endangered in the state in 1975 because of its small population and poor nesting success. Due to increasing numbers and a healthy reproductive rate, the status was lowered to Threatened in 1994, and the species was removed from the list entirely in 2000. Currently across Tennessee, the Osprey is locally common in summer, uncommon during migration, and rare in winter. 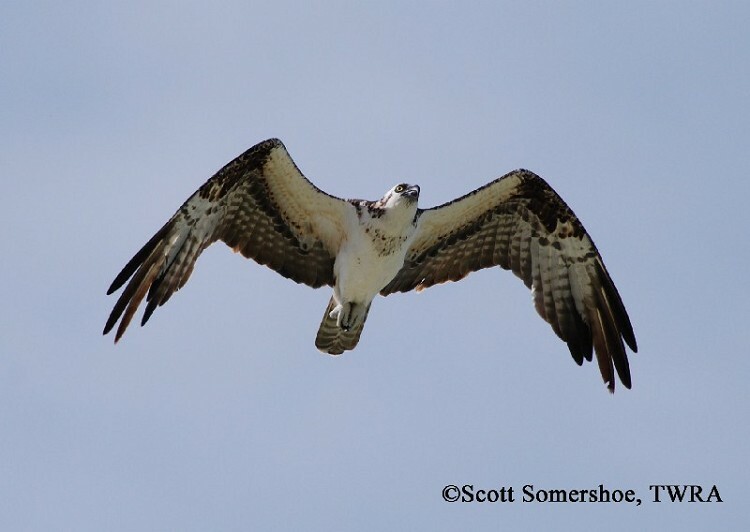 The numbers of nesting Osprey in Tennessee continues to slowly increase. An Osprey nesting in central Quebec and wintering in southern Brazil might fly more than 124,000 miles in migration during its 15 to 20-year lifetime. The oldest record for an Osprey in the wild was 26 years, 2 months. The Osprey's talons are uniquely adapted for catching and carrying fish: their surfaces are rough, and their toes can be held with three forward and one back, or with two forward and two back, an arrangement seen in owls but not in other diurnal raptors. They will carry the fish head first in line with their body to reduce wind resistance in flight. Best places to see in Tennessee: Reelfoot Lake, Watts Bar, Melton Hill, Tellico, and Fort Loudoun Reservoirs, among many others. At Watts Bar, a nest can be seen from the intersection of I-24 and Highway 840 on a cell tower northeast of the intersection of the highways. Another nest can be found on a platform visible from I-40 where it crosses the Clinch River, immediately south of the Kingston Steam Plant.